Christmas and New Year are one of those fab times that you get to snuggle down on the sofa by the fire, and demolish a load of books- plus normally in my case I get bought nothing but books! 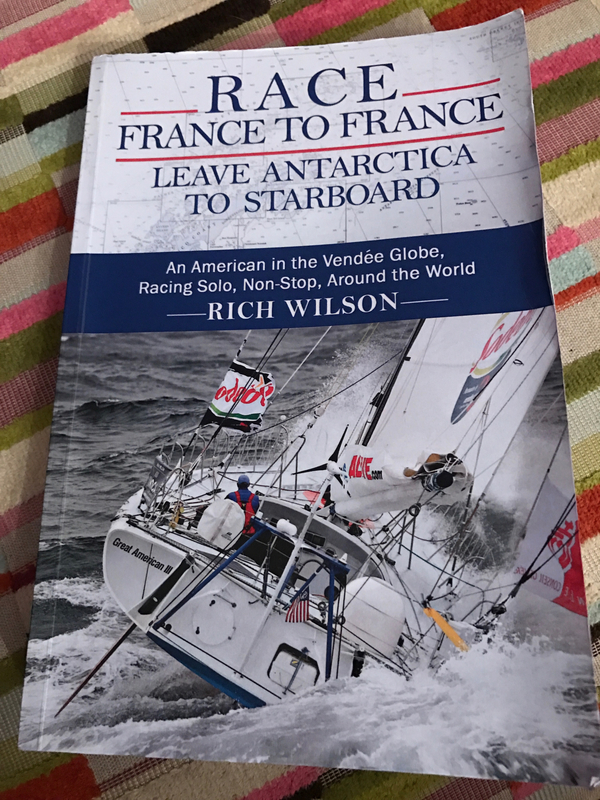 The first book that got demolished pretty much before the turkey was even on the table was”Race France to France, leave Antartica to starboard” written by Vendee Globe racer, Rich Wilson.It’s a personal account of his 2008/2009 race, but its not just about the race itself. During his campaign, Rich also started a programme to engage school children with the race, and had the vision to create a fully immersive experience allowing the teachers to bring the race to the classroom. It was published nationally across the USA, with a module appearing each week. Not only was the book a really interesting read, and it shows just what an amazing guy Rich is, but he shares a lot of philosophies about the race and what it takes to even get to the start line. defined the necessary default philosophy for a Vendee Globe Skipper. 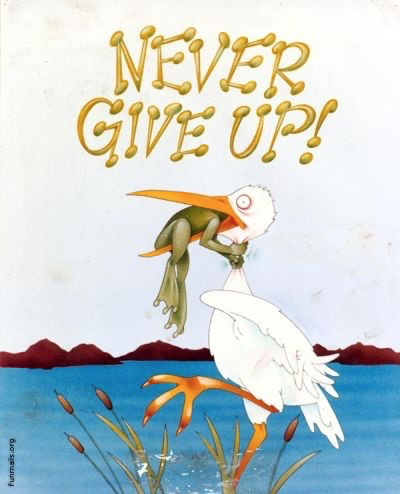 Clearly this rings a few bells with me, as it’s the saying my Uncle Jamie always used to remind me of during the tough times! Admitedly this book is about an older race, where the technology is nothing like what we are seeing during this 2016 edition, but the principals are the same, and if nothing else, Rich writes in a way that really allows you to ride along with him, and he’s brutally honest at times. As someone aspiring to compete in this race, this was a page turner for me! 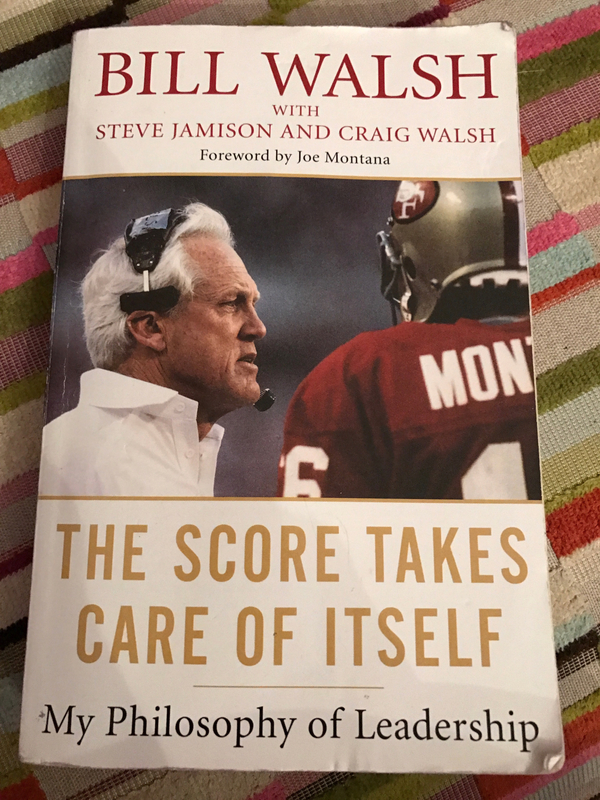 The second of my Christmas reads was “The score takes care of itself” by the late Bill Walsh.It’s a book about his leadership and revival of the San Francisco 49ers from an imploding football team with the worst record to a 5 time Superbowl winning machine!Now I’m not normally one for american football; in fact, I don’t even understand the game in the slightest, but this book is way more than football. Bill Walsh has some pretty interesting points to make about leadership styles as well as a great deal of knowledge on team building and turning things around, all backed up with his impressive career history and anecdotes from his own journey. One of the things that really stood out for me is the “standard of perfection” that he implemented and expected of his team and staff. It really was the basis of how the team functioned and it really appeals to me as a Virgo, as I myself like to aim for “perfection”. 1. Exhibit a ferocious and intelligently applied work ethic directed at continual improvement. 2. Demonstrate respect for each person in the organization. 3. Be deeply committed to learning and teaching. 6. Honor the direct connection between details and improvement, relentlessly seek the latter. 7. Show self-control, especially under pressure. 8. Demonstrate and prize loyalty. 9. Use positive language and have a positive attitude. 10. Take pride in my effort as an entity separate from the result of that effort. 11. Be willing to go the extra distance for the organization. 12. Deal appropriately with victory and defeat, adulation and humiliation. 13. Promote internal communication that is both open and substantive. 14. Seek poise in myself and those I lead. 15. Put the team’s welfare and priorities ahead of my own. 16. Maintain an ongoing level of concentration and focus that is abnormally high. 17. Make sacrifice and commitment the organization’s trademark. 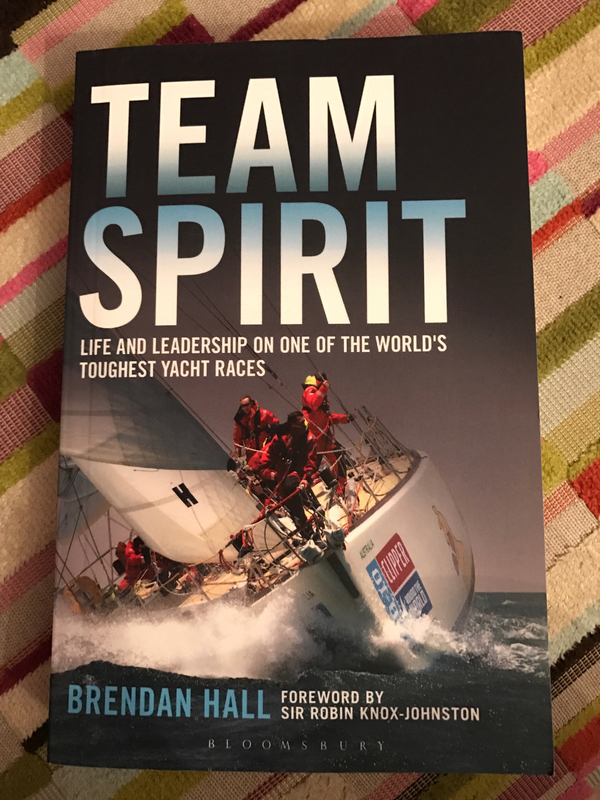 Finally the last book that I managed to read over the holidays was “Team Spirit” written by Clipper Skipper, Brendan Hall.Brendan was the Skipper of “Spirit of Australia” during the 2009/ 2010 race, and his story is quite simply- EPIC! !On the leg to San Francisco, the Skipper onboard “Hull and Humber” broke his leg and had to be evacuated by the Japanese Coast guard, and as a result, Brendan had to leave his own boat; quite literally by jumping into the water to take over the boat. His leadership skills were soon put to the test – in the middle of a North Pacific hurricane, Brendan went to the rescue of an injured skipper on a competing yacht and skippered both boats across one of the most feared oceans in the world. Brendan’s brutally honest, no-holds-barred account is revealing and instructive, with valuable lessons in leadership and management – as well as never giving up. Thrown in quite literally at the deep end, he is pushed to the limit, and learns lessons you can only learn the hard way. Not only did he get both boats safely to the finish of that leg, but he also took on a 3rd yacht that had been dismasted and created a moving “convoy” to get everyone home in one piece.It’s a real story of perseverance, and above all great seamanship, and there are a ton of lessons to be learnt from Brendan.Make sure you’ve got time to read this one though, it’s really hard to put down!